G4 Engine Mount Torque Stop - Grip N Rip Racing LLC. This is a new polyurethane motor mount torque stop that replaces the stock O Ring style rubber torque stop. The stock torque stop has very little surface area which allows the motor to move too much under high loads. Our new torque stop is designed to have a small gap between the two aluminum mounts without any load on the motor mount. This allows the motor mounts to move around at idle and minimize vibration. Once the clutch is engaged the gap will close and the stopper will minimize motor movement and clutch misalignment. This new torque stop has a large surface area to minimize movement, works very similar to the torque stop in the XP chassis. Easy installation, replaces the stock torque stop in the front left motor mount. 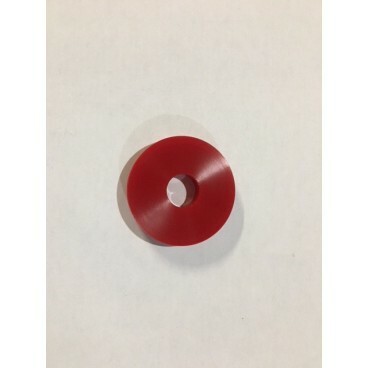 Can be used with the shim kits. Installation Instructions available at the bottom of this page. Please pick year below. If your 2017-18 G4 has had the 2019 motor mount updates installed please choose 2019 for your year. The 2019 kit comes with a spacer in the center because you can not reuse the stock one. The 2017-18 kit does not come with a spacer because you can reuse your stock one.